– Charleroi is best known around here as being the start town of the Fléche Wallonne. The Wall Street Journal tries to make it famous for other reasons, naming it the ‘ugliest’ city in Belgium. – For those of you who don’t dig PRO, here’s some ammo for you: What’s the deal with photos of real pros in the wintertime who wear earwarmers, but not gloves? That seems to defy all laws of on-the-road thermodynamics, and is a PRO idiosyncrasy I totally can’t advocate. Hands first, always! – The meltdown of Team Pegasus has been akin to your first interval session of the year: A sensation of slow-motion drowning. Discomfort throughout. All of it capped off by very real pain. And while guys like Robbie McEwen (and, to a lesser extent, Robbie Hunter) have banked a career’s worth of glory and cash, how can you not be gutted for riders like Svein Tuft, Dominique Cornu, and Bobbie Traksel — still-young talent left with the sorts of options you’d expect in mid-December: Zero. And surely there are dozens of pros with survivor’s guilt, having chatting at length with Pegasus bossman Chris White prior to signing elsewhere. As you’d expect, the best coverage of l’affaire Pegasus came not from traditional cycling media, but rather was led by bloggers, the best of which include the increasingly vital Inner Ring blog and Joe Lindsey’s Boulder Report. – More regarding blogs: A chapeau to Whit Yost’s superb Pavé for two things going on there: (1) Indisputably the best 2011 racing season preview anywhere. His team-by-team breakdown is indicative of a supreme love of the sport or madness. I’m not sure which. (2) His new (near-daily) feature called ‘The Sticky Bidon’ — a brief bulletpoint list of the 5 or 6 most interesting cycling stories or blog postings of the day. Think of it as a super-refined RSS reader. – A ray of hope for the young and now-jobless riders of Pegasus: Note that Pat McCarty survived his year in the cold (having spent 2010 racing for Richardson Bike Mart and other regional-at-best Pro-Am teams.) For 2011 he’s racing with Team Spidertech, newly minted with its Pro Continental license. ** Rather than ‘What we’re revealing today’ or ‘the big surprise’, instead we get ‘the big reveal.’ Reveal is not a noun. Never ever. ** Rather than ‘We’re working together with…’ or ‘We’re collaborating with’ or ‘We’re engaged in a partnership with’, instead we get ‘We’re partnering with…’ Partner is not a verb. Never ever. ** Rather than ‘Our Marketing spending for December is…’, instead we get ‘Our Marketing spend is…’ Spend is not a noun. Never ever. ** Rather than ‘Our request from you is…’ or ‘What we’re asking from you is…’, instead we get ‘Our ask is…’ Ask is not a noun. Never ever. – A Cervélo update: In what’ll go down as probably the irony of the year, I think I can safely state that the level of communication between Competitive Cyclist and Cervélo is the strongest it’s been in over 2 years. We’ve had extensive (literally weekly) discussions on the state of high-end bike retail, online retail, and the ways in which our companies could possibly work together. We’ve brainstormed and shared ideas in an ongoing high-quality dialogue that, if we’d been doing it for the last 2 years, would’ve probably resulted in having us sell 3x as many Cervélos as we did. But, alas, we’re in relationship triage. Ours is an urgency and intimacy of the sort that surrounds things only when they’ve reached a terminal state. Love has its sweet nothings. Death has its sad nothings. Last week we came to the joint conclusion that we won’t be able to work together in 2011. So despite my earlier optimism that indicated otherwise, we’ve officially closed the book on next year. In doing so, I’ll state two things: (1) Phil White, in his words and in his actions, reconfirmed for me that he’s one of the most pleasant and sincere people in the bike business. Despite the dissolution of our relationship for 2011, he’s unquestionably a class act. 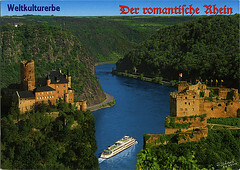 (2) The train from Frankfurt to Koblenz is 90 minutes long, it runs alongside the Rhine with towering 1,000 year-old castle after castle — a beautyscape befitting the very important meeting we’ll be having there in late January. – One final note on Cervélo: We heard this week that long time Cervélo veteran Chris Bastie has left the company. Chris was a rock at Cervélo, and probably handled more consumer interaction than the rest of the company combined. Whether it was spelling out the technical details of a new frame model, facilitating a fork recall, or nicely-yet-firmly explaining why driving your roof-racked R3 into the garage doesn’t earn you a warranty claim, he did it all. Not unlike when Betsy Hilton left the company earlier this year, it’s a shocker to see a veteran of such stature leave. – The sobriquet ‘Boulder Racing News’ first tickled our ears a few years back courtesy of Jeremiah Bishop. He was commenting on what he saw as a hometown/home state bias in VeloNews reportage. This was before they did a feature on him that indicated that, yes, Bishop doesn’t live in Colorado and prefers the unheralded Harrisonburg, Virginia as his home base, and that made him suspect, quirky even, particularly since he didn’t have any good friends among Colorado-based pro mountain bikers. The name came to mind because of our utter disappointment in VeloNews’ coverage of their homeboy Chuck Coyle’s non-analytic positive drug test. To explain this story they called up boldface-named Boulder cyclists, who, not surprisingly, were surprised by the news. There is hardly an older news cliché; any journo can always find some neighbor who is surprised and express as much on tape. VeloNews even trotted out Coyle’s neighbor Chris Baldwin to vouch for the guy. I’m sure there are people who will vouch for Pennsylvanian Joe Papp being a clean rider. Doubt VeloNews ever looked for these people for Papp and other dopers. Likewise, I doubt they made an effort to find friends of Michigan’s Kirk O’Bee to express surprise at his second doping positive. Or people to vouch for Seattle’s Kenny Williams that he normally wouldn’t use DHEA but he just cares so much. But homeboy Tom Zirbel was able to go on at length about his innocence, and VeloNews didn’t bother asking him hard questions. Coyle’s ‘dog ate my homework’ excuse article shows he’s no pro. Kudos to Steve Tilford for ripping the piece to shreds. Coyle’s not like Boulder local Tyler Hamilton, who won people over with his vanishing twin. Hamilton’s ‘depression’ excuse dominated his second positive with no corroboration, no re-reading of his earlier statements and no asking him to explain, and no questions asked about why he should be trusted about anything ever again. Or transplanted Boulderite Rory Sutherland, who was sacked by Rabobank after getting busted for having Clomiphene in his system. Sutherland was profiled in VeloNews in 2008 and fobbed off his drug bust with the classic non-denial denial about how he didn’t even know what the stuff was, and VeloNews backed him terming it an obscure pregnancy drug. Apparently, they liked Rory so much they didn’t even bother googling, where they would have found it is a common fertility drug , one of the most. Sutherland’s 2009 teammate, Floyd Landis, didn’t get such a nice reception from VeloNews when they ran a ‘what’s up with Floyd’ article in 2009. The article was a rare moment of honesty when it came to the subject of doping in cycling. Seemed like VeloNews had finally figured out how to cover dopers. But maybe they just recognized that Floyd didn’t live in the cool kids town anymore. As biased as their coverage of dopers seems, the bigger problem is that VeloNews usually seems to be afraid of their own shadow as a news organization and in equal measure present themselves as fanboys, as a local newsaper that only publishes good news, a veritable pennysaver rag of bike racing. It’s particularly strange after reading their media kit , where they report their reader’s median age is 45, their average household income is $167,000, 96% have attended or graduated college, and 48% have post-graduate degrees. You’d think VeloNews would realize they have a smart, sophisticated readership. Not only do they seem to go out of their way for hometown dopers, not extend the same treatment to out of town dopers, but they fail to investigate headline-generating team failures. When the Bahati Foundation team folded in the spring, they treated it as matter-of-fact news. This kind of failure wasn’t supposed to happen anymore; the team had just started over the winter, they had to have a bank guarantee, they had a boost in funding from Landis backer Brent Kay. Since Landis was the last guy on the team, it seemed like Kay was paying for Floyd’s spot. When Kay pulled out after Floyd’s Tour of California revelations, the team folded. Seems like Kay was funding the whole team. Odd, but it was treated by VeloNews as business as usual. Last week, in VeloNews’s end-of-year highlights issue, just out, that the team members were gluing their own tires the day after the team launch. And that there was some kind of punch-up between team directors at the Joe Martin stage race. Juicy stuff, but they only alluded to it in their May piece. It took until December to find out there was a fight? The Bahati Foundation team launch was March 12. The team folded at the end of May, despite reports to the contrary. VeloNews publishes the news in the January, 2011 issue under ‘Domestic Road: Letdown of the Year.’ The letdown was that the team folded, not that two of their three most prominent riders were tagged in drug scandals. Between May 28th and now there has been no news on why the team folded less than two-and-a-half months after their launch party. ‘Improprieties?’ It seems like much more than that; we’re guessing shell game is more apt. No one interviewed title guy Rahsaan Bahati. 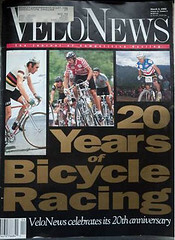 And VeloNews, ‘The Journal of Competitive Cycling’ doesn’t seem to have the desire to get into this. 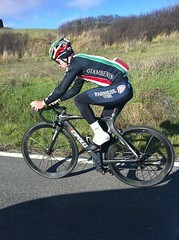 Just this week they reported that Bahati is riding for an amateur team. They can’t get any news about what happened with his eponymous team, but they’re happy to report he found a new amateur team to ride for. Occasionally, VeloNews wakes up and does some good reporting. Charles Pelkey had an informative piece on the process of getting official word of your doping positive. He’s the best reporter they have. Neal Rogers, the author of the first Coyle piece, either unwisely defended himself or just defended himself unwisely (see comment #14) on Steve Tilford’s blog, and was rightly criticized for it, (Neal, our advice when quoting busted dopers is liberal use of words like ‘alleges’ and ‘claims’; unless you have corroboration from another source, it isn’t a fact) seems to have been stung and finally did some real reportage and found that Coyle received the EPO shipments at his house. Coyle wouldn’t comment. The new story also finally gets around to asking USADA about it and they point out that Coyle made a confession, which he didn’t have to do. This is the kind of stuff that should have appeared in the first piece, and the kind of information that it seems only a browbeating compelled Rogers to dig for. Then again, maybe USADA approached Rogers after seeing the story. Wonder what the stars of Boulder cycling think.